I remember the first time I saw Sulphur's Chance in the flesh. Words cannot describe it. He really touched my heart, with his presence, spirit, and power that he is Sulphur's Chance! Photos did not do him justice at all! It was during the year of 1998 when Dave and I went to Utah to get Sulphur's Tia and Sulphur's Quest to bring them to Oregon after purchasing them. 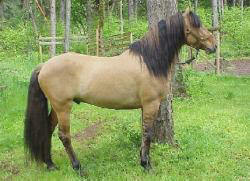 We had told Ron Roubidoux that we really liked Chance and would do anything to help Ron promote his stallion. It was later a few months that Ron bought Chance to Oregon to start his show career. Did Chance rock the horse industry where ever we took him to, open schooling shows, major horseshow's and BLM wild horse program at adoptions. Since Oregon is known for its Kiger mustangs, sometimes Chance was thought to be a Kiger, when people 'aaaahhhh' over his wild dun markings and say they never seen a Kiger with such markings, which we will explain that Chance is not a Kiger, but a Spanish Sulphur stallion from Utah's Sulphur HMA, and that he is registered with the Spanish Mustang Registry, American Buckskin Registry Association and American Indian Horse Registry, Inc, during that time we leased, trained and showed Chance, mostly he was well promoted as a Spanish Sulphur stallion registered with the Spanish Mustang Registry and American Buckskin Registry Association. He started his first major shows at the PWHC, KigerFest! and the ABRA. At the ABRA show, he was prejudiced because he was a Spanish 'Mustang", although most of the ABRA member's believed he should have placed well in the dun factor class. 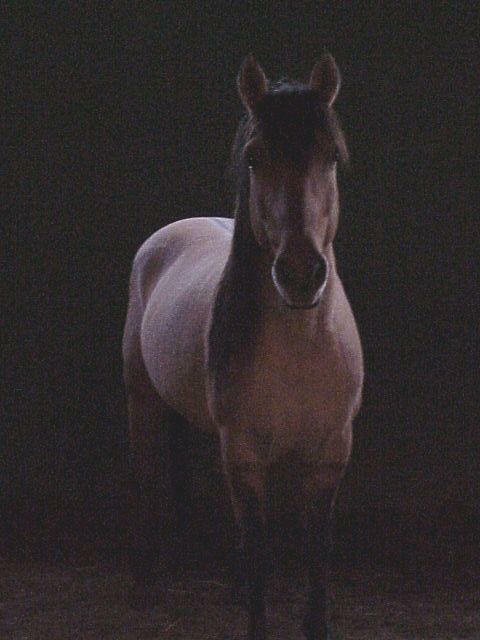 He was presented at the Canby wild horse and burro adoption, where he was aired on TV. Not only that, Chance is also well presented in books, magazines and artists also used Chance as a model horse for their artworks. During the time he was in Oregon, he bred to outside mares for the first time, mostly to Kiger mares, who owners wish to bred for more dun factor and Spanish type. One year later, we were offer the first choice to purchase Sulphur's Chance, which we did! 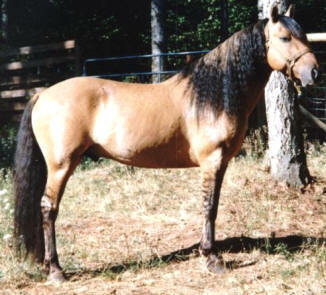 During that time we owned Chance, he was shown at Kiger Fest 2000, winning High Point Dun Factor stallion and High Point Mustang stallion and also he was presented at the 2000 Del Mar, CA's Equine West along with Cammie Seferoich's two Sulphur colts, one was Chance's first grandson; Sulphur's Anhur Maximus. At Equine West, the Sulphur's were getting a lot of attention that people kept coming back to see and hear about Utah's famous 'zebra Sulphur's'. On the way back to Oregon, we stopped by to visit Robert Smith, a wonderful man in his 90's who made a record history of the highest bidding of a BLM Kiger Mustang filly for the sum of $19,000. Mr. Robert Smith fell in love with Chance when he laid eyes on him. It was a few weeks later after several emails back and forth from his caretaker and long time friend Coni Florey that Chance helped me make the decision to sell to Mr.Robert Smith, helping a wonderful gentleman's dream come true to own a true Spanish stallion, and he had done his research on the Spanish Sulphur's! by becoming the first Spanish Sulphur breed to be registered as F-001 in ASHA. Sulphur's Chance is gone... "it looked as if he died when he was standing looking over the valley. He is buried in the meadow on his favorite spot. The girls never left him, they stood over him all the time. Now they spend a lot of time on the knoll where Chance is buried. With the History behind Chance and his progeny so much in demand we are petitioning for a Breyer Model to be done of this magnificent Sulphur Stallion. Click here to view Sulphur's Chances show record, his offspring registered within the SMR, Publications in which his photo appeared and the registry's he was registered in.